It is 20:48 and I am already tucked into my fedderbett. I probably should take a statin drug after what I ate for dinner. At first nothing looked good on the Swiss menu. There were no good antipasti. Surely I would not order pasta here, and certainly not the pizza. Where are the grilled fresh vegetables? So we both went with Rösti and salad. The former are a little like hashbrowns but worse for you, dripping with cheese. At least mine had sliced tomatoes on them. Oh my God, get me back to Italy before I kill myself on this food! The wine is marginal, but the country is jaw-droppingly beautiful and the trains are lovely. We’ve been on four different types today coming from Rome to Lauterbrunnen. (Examples below.) Now to sleep as we only had 4 hours on New Year’s Eve. 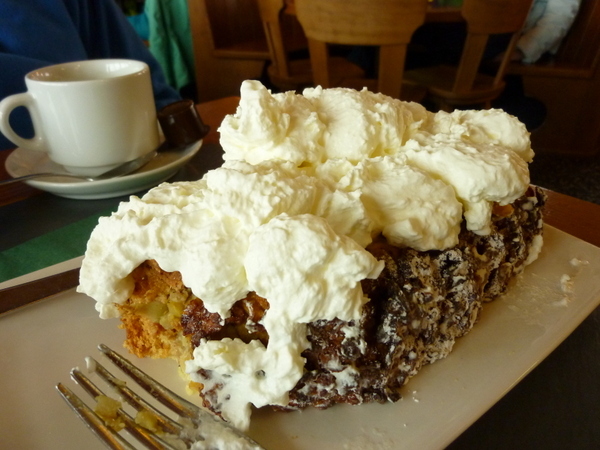 Apfelkuchen for 2nd breakfast at Kleine Scheidigg. The apples are barely mortared together with cake. Yes, it was huge. Luckily it was for two. Kleine Scheidigg and in a heavy snow storm there determined hiking down was not in the cards, so we took another train to Grindlewald, a larger ski resort. Luckily the pass we purchased covers all forms of lifts, gondolas and trains for three days as the tickets purchased one-at-a-time are quite pricey. Reversing, we came back to Wengen, the snow stopped, the clouds parted, the sun came out, and we caught a gondola to a magnificent viewpoint at Mannlichen. We rode so many transports we actually amortized the cost of the 3 day pass in one day. Ric was in heaven, and we managed to log over 8 kilometers on foot too. 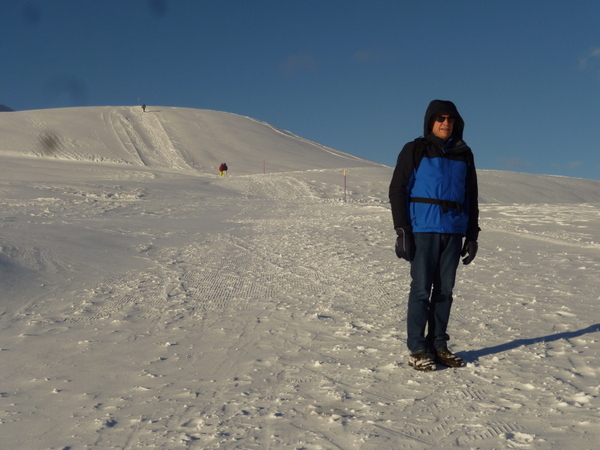 Ric in the snowfield at Mannlichen. Yes, it was cold! snow packed for your pleasure. And the temp hovered around 28-30 Fahrenheit, practically spring in Minnesota. Then take a lift or train back up and do it again! People warned us it was expensive here. They were right on some things. For example, a bottle of water that is CHF 2.20 in the valley where we are staying is Euro 1.80, or $2.44. Up on the mountain, that same bottle of water is CHF 5.50! 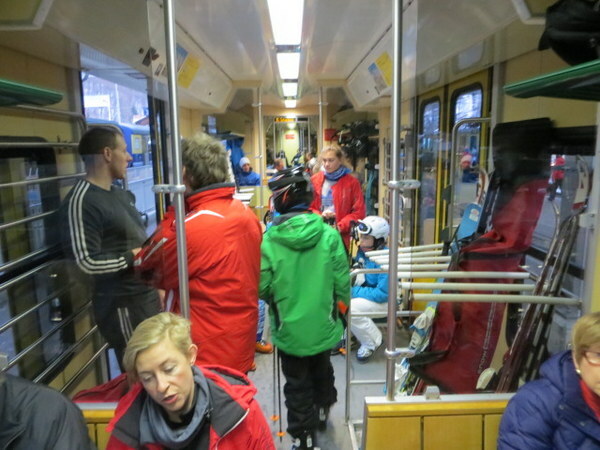 But everything has to be carted in on the train, increasing costs considerably. I shudder to think the cost of bringing fresh vegetables in. Dinner was on par with prices in Rome, although the wine cost more and was of lower quality. We are spoiled at wine quality and price in Italy: It’s a basic human right to have good wine at a reasonable price in Italy. I miss hearing and speaking Italian. I never know what will come out of my mouth now. Buongiorno gets a funny look, as does grazie, but guten morgan sounds strange from my lips. Funny, though, I remember my numbers in German although I haven’t spoken it in 40 years. 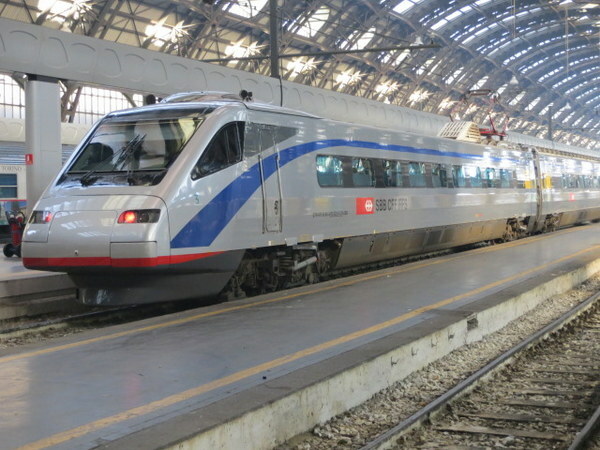 We sat next to four Italian young people on the train this afternoon and I really enjoyed eavesdropping on their conversation. The most priceless statement from one young man, probably 20-22 years old: “I hate the telephone. I never call anyone on my cell phone, except my mamma.” Bravo! Hi, May i know what pass you bought that covers all the rides? been trying to figure out what pass is available for winter season because those that i saw is only valid for summer season, Thanks! I am not sure…. We went to the Tourist Info office and they recommended one that covered only the Lauterbrunnen Vally. It was not cheap, but it did cover everything plus 1/2 price on the Schilthorn. As luck would have it, we are going to the area again tomorrow! I will try to gather more info on passes. Ric is in heaven with the trains. 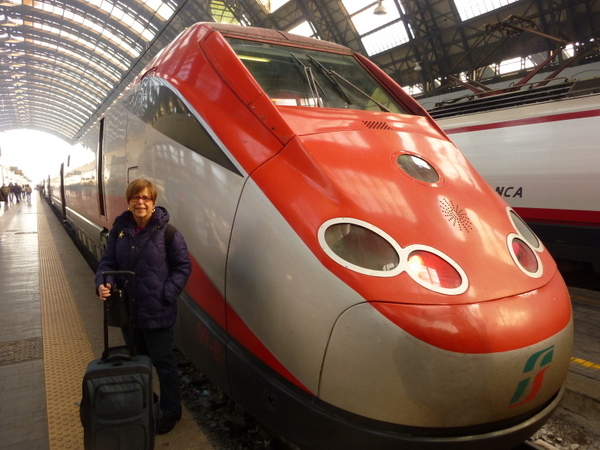 In two weeks we go again, on a shorter weekend trip, but I am thinking of taking him to Torino for his birthday, just because it is a nice long train ride. HNY to you and Scott! Happy and healthy new year to you both!! Grazie Kim! You and Mark as well! Happy New Year to you and Ric! Thanks for bringing back fond memories of beautiful Switzerland (way back when, we visited Lucerne and Bern) and sharing photos of your experiences. It has been fun living vicariously through you! I forgot you had been here! It is truly beautiful, but I miss Italy! Love your posts, Laurel! The trains are so romantic! Living your trip with you! Thanks for sharing! Thank you Janet! More to come as we are still in Switzerland. Gracia and I spent 4 summer days in Lauterbrunnen 20+ years ago – it was expensive then too! 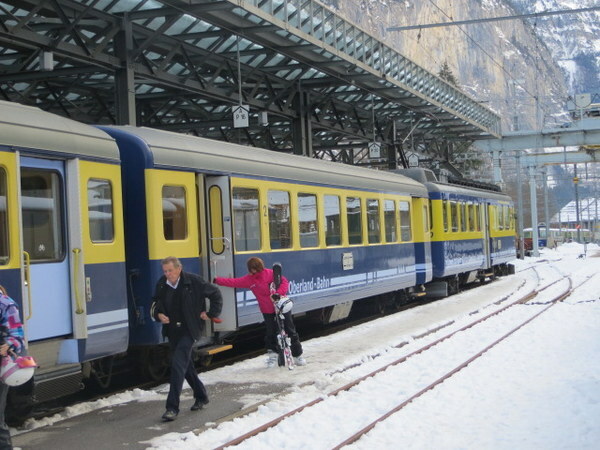 I remember taking the train up to Kleine Scheidigg and then walking back down, passing through Wengen. I remember it as a beautiful walk. Maybe we will get to do that one tomorrow! 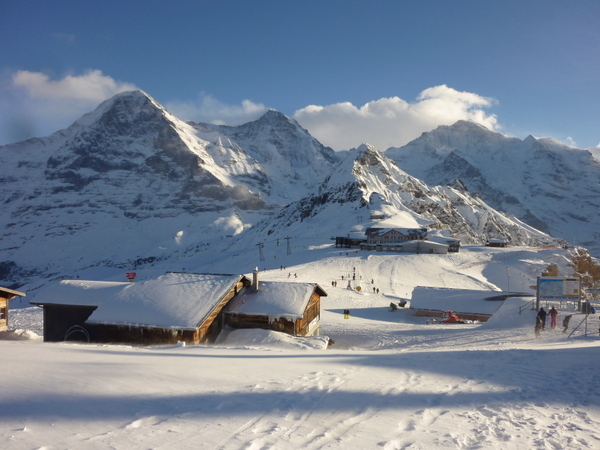 There’s been a closure from K-S to Mannlichen for two days, but I think Wengen is open. Hopefully I’ll get the January 3 posting done tomorrow, Jan 4. 🙂 Cheers!